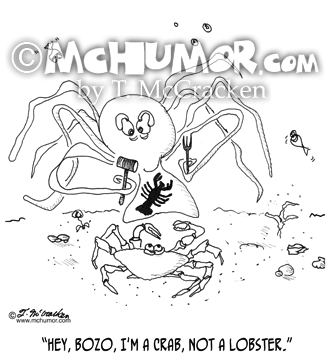 Crab Cartoon 1435: A crab says to an octopus with a lobster bib, a mallet and a fork, "Hey, Bozo, I'm a crab, not a lobster." 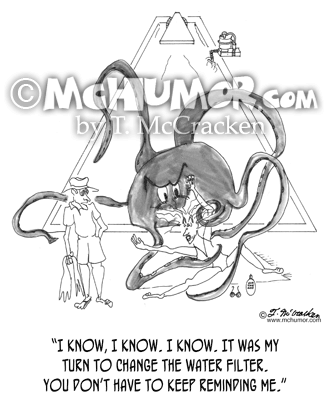 Texting Cartoon 8351: An octopus text messages, "Alert! Fisherman Near Bridge" to fish wearing ear pieces that pass by a bored fisherman. 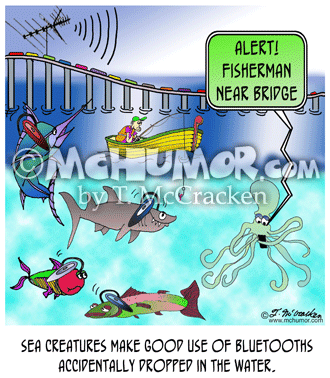 "Sea creatures make good use of Bluetooths accidentally dropped in the water. Water Cartoon 0902: As a huge octopus-like creature comes out of a swimming pool and wraps it's tentacles around a woman a man says, "I know, I know. I know. It was my turn to change the water filter. You don't have to keep reminding me." 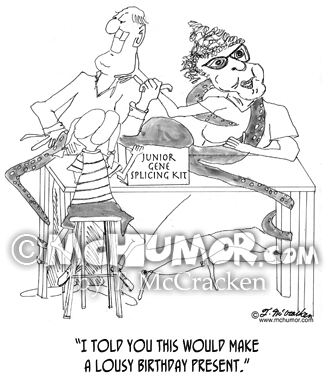 Genetics Cartoon 0074: Man to wife being strangled by creature that's come out of their kid's Junior Gene Splicing Kit, "I told you this would make a lousy birthday present."